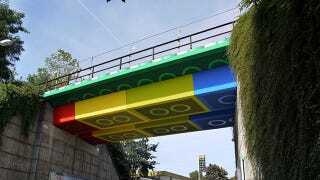 Street artist MEGX painted this bridge in Wuppertal, Germany to look like it was made out of LEGO. His use of colour and contrast makes the thing look like a hideous Photoshop job, but nope, it's real. The guy got busy with paintbrushes and, after four weeks on the job, left the world with the coolest bridge around. If you're wondering how he managed to sneak up there for four weeks without the cops catching him, it was actually a legit operation, as he had some corporate sponsorship and the local authorities helped out with supervision and traffic control.